A quick overview of JPA Mapped Superclasses. A mapped superclass provides persistent entity state and mapping information but is not itself an entity. A mapped superclass, unlike an entity, does not allow querying, persisting, or relationships to the superclass. 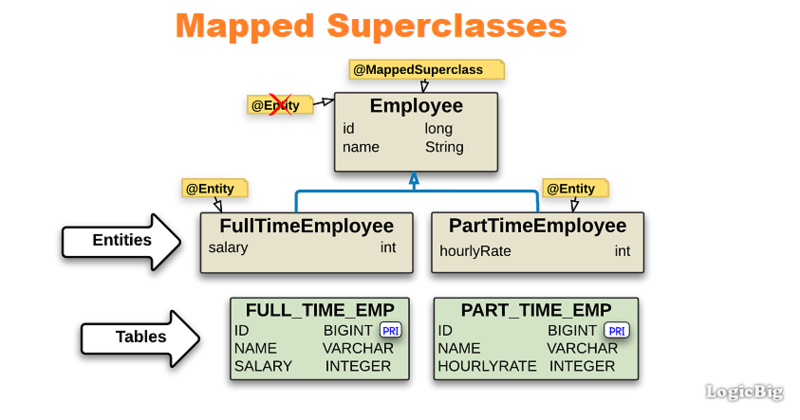 @MappedSuperclass annotation is used to designate a class as mapped superclass. All mappings annotation can be used on the root class except for @Entity. Also persistent relationships defined by a mapped superclass must be unidirectional. Mapping information may be overridden in the subclasses by using the @AttributeOverride and @AssociationOverride annotations. Both abstract and concrete classes may be specified as mapped superclasses. It is similar to table per class inheritance but no table joins or inheritance exists in data model. There's no table for the mapped superclass. Inheritance only exists in object model. The main disadvantage of using mapped superclass is that we cannot load all entities (subclasses) represented by the mapped superclass, i.e., polymorphic queries are not possible. Note that, we cannot create a JPQL query like 'select t from Employee t' which can load all subclasses. That is only possible when we use an inheritance strategy: SINGLE_TABLE or JOINED. or TABLE_PER_CLASS.